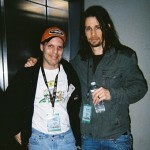 Congrats to Spokane’s very own “Rock Star” MYLES KENNEDY… confirmed to now be in the studio working on the new SOLO CD! Oh and did we say, with the “Guitar hero’s” guitar Hero? SLASH…. That’s too many World Champion Axe-Men for one location. Goodluck and can’ wait to hear it! (Myles Kennedy a local favorite and only 7-time winner of the Spokane Axe-man Competition. And that was BEFORE he played for Mayfield-4, Citizen Swing, or Alterbridge) He is a great guitarist and a really great guy.